Hypertension, or high blood pressure as it’s more commonly known, is a serious health problem that affects many Americans. Over time, the damage that it causes to blood vessels can lead to heart disease, stroke, kidney damage, and other medical conditions. 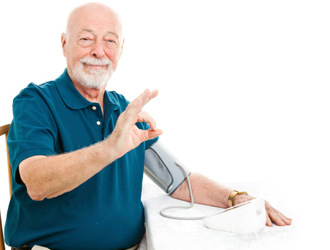 High blood pressure can go unnoticed for years, which is why it is called the “silent killer.” Many people do not display symptoms until it is too late. A diet designed to fight high blood pressure is one of the many ways you can reduce your risk of developing hypertension. The DASH (dietary approaches to stop hypertension) diet is one method. This diet aims to reduce high blood pressure by reducing your intake of fat, sodium, and alcohol. If you’re looking to reduce your blood pressure, this diet also recommends eating foods that are rich in potassium, calcium, and magnesium. The DASH diet also recommends introducing more low-fat protein into your diet, as well as whole grains and lots of fruits and vegetables. This includes leafy greens, potatoes, beets, and fruits like berries and bananas. Drinking skim milk is another way to reduce the risk of developing high blood pressure as well. Eating oatmeal at breakfast is also a good start! If you have high blood pressure or you’re looking to avoid developing it, there are several easy ways you can do so. It’s as simple as introducing many tasty foods to your diet as part of the DASH diet to lower high blood pressure. In fact, many of the foods in the DASH diet may already be staples for you! These blood pressure-reducing foods include the doctor-recommended four to five servings of fruits and vegetables a day, including green leafy vegetables, like kale, arugula, and broccoli. You can satisfy your sweet tooth by eating fruits like berries, kiwi, avocado, and bananas. Consuming the right types of grains (six to eight servings a day) is also a good way to reduce your high blood pressure. The trendy quinoa and certain kinds of cereals are staples for reducing blood pressure. As for dairy, a diet that includes two to three servings of certain dairy products, including skim milk and fat-free plain yogurt, can both lower your blood pressure and prevent you from developing hypertension in the first place. Finally, lean meats, such as pork, poultry, and fish, can also help to greatly reduce high blood pressure. It is recommended that you get about two servings per day of lean pork and fish like Tilapia. Snacking on nuts, seeds, and legumes is also a good choice for protein; four to five servings a week of flaxseed and white beans are recommended. The DASH diet to reduce blood pressure recommends four to five servings of vegetables a day. And to get this, you shouldn’t think of fruits and vegetables as just side dishes. You can prepare many tasty meals that are composed entirely of fruits and vegetables. Frozen or fresh vegetables are fine, but one tip to remember when selecting frozen vegetables is to be sure to check the sodium levels first, since lowering high blood pressure also involves reducing sodium levels. If you seem to be struggling to get enough fruits and vegetables into your diet, try to boost your intake through stir-fries or substituting meat with more vegetables. One of the recommended vegetables in the DASH diet is kale. This green leafy vegetable is widely recognized as a “superfood” due to its antioxidant properties. It also contains alpha-linolenic acid, a good fat that helps to soothe inflammation. It’s a great substitute for lettuce in salads. In fact, one cup of kale contains many nutrients, including nine percent of your recommended daily intake of potassium and calcium, as well as six percent of your recommended daily intake of magnesium. In addition to lowering your blood pressure, broccoli also has many cancer-fighting properties. Broccoli can be used as an easy side dish with many meals. Just one cup of broccoli contains six percent of your daily recommended calcium, eight percent of your recommended magnesium intake, and 14% of your potassium. Fruits require little or no preparation and make an excellent, healthy snack, especially when you’re in a rush. Canned and frozen fruits are an acceptable part of the DASH diet to lower hypertension, but you should make sure that they are sugar-free and contain no additives or extra salt. Adding fruits to your diet is just one tasty way to cut your risk of developing high blood pressure. Berries, especially blueberries, are rich in flavonoids, a natural compound that can greatly reduce—if not outright prevent—hypertension. Adding berries to your diet can be as simple as sprinkling a handful over your cereal every morning and adding a few to your yogurt as a snack. Bananas should also become a staple in your DASH diet if you’re looking to fight high blood pressure. Besides being high in potassium, bananas are an affordable snack for your mid-morning break or when you hit the “3 o’clock wall;” they’ll carry you through to dinnertime, no problem. If your banana turns a little too ripe for your liking, peel and slice it and throw it in the freezer for use in a smoothie. One banana contains one percent of your recommended daily dose of calcium, eight percent of magnesium, and 12% of potassium. Kiwifruit is available year-round and can be stored both in your fridge and on the counter. Just one kiwi contains more vitamin C than an orange. Plus, eating one kiwi a day will give you two percent of your recommended daily calcium, seven percent of your recommended magnesium, and nine percent of the potassium you should consume every day. If you’re looking to lower your blood pressure, the DASH diet recommends trying whole grains. Whole grains can include brown rice and whole wheat breads and pastas. Grains are also low in fat, so you should avoid spreading butter or cream cheese on too thick, as that cancels out their benefits. Two whole grain superfoods that assist in fighting hypertension, in particular, are quinoa and cereals. Quinoa has quickly become recognized as an excellent source of protein. In fact, in 2013, the United Nations declared that is was the year of quinoa. It has a mild, nutty flavor, contains phytonutrients and magnesium, and is gluten-free. It can also be prepared quickly, making it the ideal choice for busy people who may not have the time to prepare healthy meals. A half-cup of quinoa provides 1.5% of your recommended daily calcium intake, 15% of the magnesium you need every day, and 4.5% of your recommended daily intake of potassium. When it comes to breakfast, if you eat cereal, you may already be consuming a necessary part of the DASH diet. Whole grain cereals, such as oatmeal, oat squares, bran flakes, and shredded wheat, can greatly reduce your risk of developing high blood pressure. It’s recommended that you eat these types of cereal several times a week. Combining cereals with berries can boost your cereal’s health benefits. Dairy products such as milk, yogurt, and cheese may be an excellent source of vitamins and nutrients, but if you are on the DASH diet, you should make sure that the dairy products you are buying are low-fat or fat-free. For instance, low-fat or fat-free plain yogurt can boost the amount of dairy you consume while limiting fat intake. Adding fruit increases the health benefits. Best of all, yogurt can be used for everything from breakfasts to desserts to sauces. One cup of fat-free yogurt contains 49% of your recommended daily intake of calcium, 12% of your daily magnesium, and 18% of the potassium you need each day. While lean meats are an essential part of the DASH diet, even the leanest cuts of meat still contain fat and cholesterol, so you should consider limiting your intake. Still, lean meats contain essential proteins, vitamins, and minerals, which all offer key nutritional benefits. A good balance can be achieved by cutting back on the amount of meat you consume by one-half to one-third and replacing it with vegetables. Trim any excess fat or skin from all cuts and broil, grill, or roast the lean meat, rather than frying it. Eating fish, such as tilapia, is an excellent way to reduce cholesterol, since it contains omega-3 fatty acids. A four-ounce serving of tilapia contains eight percent of your recommended serving of magnesium and potassium. It’s available year-round and is low in the toxins often found in other fish. It can be prepared a number of ways and can be combined with a number of fruits and vegetables for a healthy meal. Almonds, sunflower seeds, lentils, kidney beans, peas, and other nuts, seeds and dry beans are an essential part of the DASH diet, since they contain fibers and phytochemicals essential in fighting against heart disease. It is recommended that you keep the servings small, especially with nuts. Nuts may have a bad reputation due to their fat content, but it is good fat. Crushed or ground flaxseed in foods such as yogurt, cereal, and smoothies will ensure that you’re getting the essential fibers and omega-3 and omega-6 fatty acids you need. While fat may have its benefits in helping your body to absorb essential vitamins, too much can lead to a number of health issues, including high blood pressure. The DASH diet aims to limit your daily intake of fats to just 27% or less of your recommended daily calorie intake. It is also recommended that you focus on healthy monosaturated fats and oils at two to three servings a day. An example may be one to two teaspoons of soft margarine, light mayonnaise, or olive oil-based salad dressing. You should aim to cut down on your consumption of trans fats and saturated fats; that includes cutting out snack foods and carefully reading labels to make sure that salad dressings and margarines have a low level of saturated and trans fats. Going on the DASH diet doesn’t mean that you have to give up everything that you love. Eating a one-ounce square of dark chocolate daily can greatly reduce high blood pressure. This is especially beneficial for people who already have high blood pressure. Dark chocolate is high in flavonoids, which are compounds that cause blood vessels to dilate. Reducing high blood pressure can be as simple as changing your diet, cutting out some foods and adding certain foods to boost your health. The DASH diet offers many tasty ways to lower your blood pressure through diet. Whether you currently suffer from high blood pressure or you’re looking to prevent it, introducing the foods outlined above (and summarized in the handy chart below) while cutting back on unhealthy fats are just a couple ways to enjoy improved heart health. Cutting out alcohol and caffeine, as well as reducing your sodium levels can also help. Make the change gradually and forgive yourself if you make the occasional slip-up. Like athletes, having the occasional “cheat day” is perfectly fine, as long as you don’t go all out. Finally, adding physical activity to the DASH diet is the best way to improve heart health. Don’t hesitate to talk to your doctor or a nutritionist for more information to get you on the path to better health and lower blood pressure today.